описание (ru) Relyze позволяет осуществлять реверсинг и анализ x86, x64 и ARM программ в симпатичной оболочке. Поддерживает сравнение двух программ и различные визуализации. Navigate a binaries structure and discover how it is composed. Visualise the data and enrich the analysis with symbols. Let the analysis reconstruct control flow graphs, resolve indirect calls, generate references, discover stack variables and more. Modify and annotate the analysis as you work. 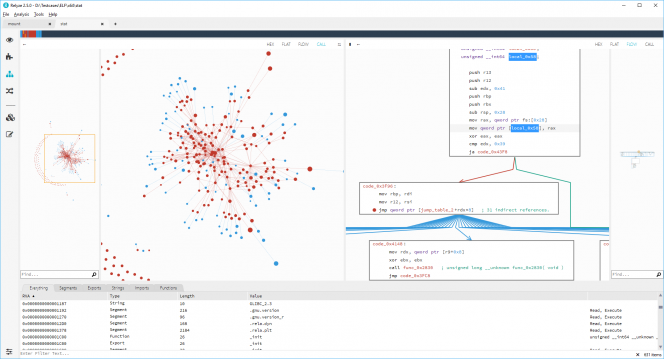 Explore the relationships between code and data with interactive control flow, call and reference graphs. Perform a differential analysis against two binaries and explore their similarities and differences. Relyze crack employs a sleek modern interface with a flat UI design ethos in order to bring the analysis to centre stage. A rich Ruby plugin framework lets you expand the capabilities of Relyze 2 with your own plugins. Bugfix: Support hosting a custom Ruby installation for Ruby version 2.4 and higher. Bugfix: Allow the creation of code blocks in uninitialized memory. Bugfix: Process call sites for noreturn function targets as expected. Bugfix: Access violation when going out of full screen in flat view via F11 key press. Bugfix: Favour ELF section header RWX flags over program header RWX flags when applicable. Bugfix: Process a relocations addend as expected when loading ELF object files. Bugfix: Honour section alignment when loading ELF object files. Bugfix: Incorrect detection of function epilogue in ARM under certain conditions. Bugfix: Create an unnamed user defined type via PDB symbols as expected. Bugfix: Prevent potential circular reference when resolving unknown data types. Bugfix: Mouse over number preview could fail under certain conditions. Build: Update Ruby from 2.2.0 to 2.5.1. Build: Update LLVM from 4.0.0 to 7.0.0. Build: Update Clang from 4.0.0 to 7.0.0. Build: Update SQLite3 from 3.18.0 to 3.25.0. Build: Update DbgHelp and SymSrv Redistributable from 6.3.9600.17298 to 10.0.16299.15. Build: Update Visual C++ Redistributable from 12.00.21005 to 14.15.26706. Analysis: Add 32-bit Turbo Debugger Symbol (TDS) file loading support. GUI: Support backwards navigation in the code view when pressing mouse back button. Bugfix: Ignore NULL RVA pointers when processing CXX or SEH exception metadata. Bugfix: Hint thumb mode via .pdata entries for ARM PE binaries. Bugfix: Include the condition code when rendering the pseudo ARM instruction MOV32. Bugfix: Unhandled exception on Win64 during failed Delphi name unmangle. Bugfix: Improve Borland __fastcall detection under certain circumstances. Bugfix: Embedded COFF symbols processed incorrectly under certain circumstances. Bugfix: Allow a code block that falls through into adjacent data to convert to code under certain circumstances. Bugfix: Rewrite internal function control flow graph depth first search visitor algorithm. Bugfix: Link against dbghelp.dll by name and not ordinal, prevent unnecessary loading of imagehlp.dll. GUI: Refactor the overview information list to use a standard list control. Bugfix: Set stackchkfail and stackchkfail_local as noreturn. Bugfix: Plugin @relyze.tabdisplaygraph and @relyze.graph_dialog were not displaying edges correctly. Bugfix: Performance regression in static library analysis. Bugfix: Performance regression in analysis pipeline during function analysis. Bugfix: Memory leak in UI tab bar. 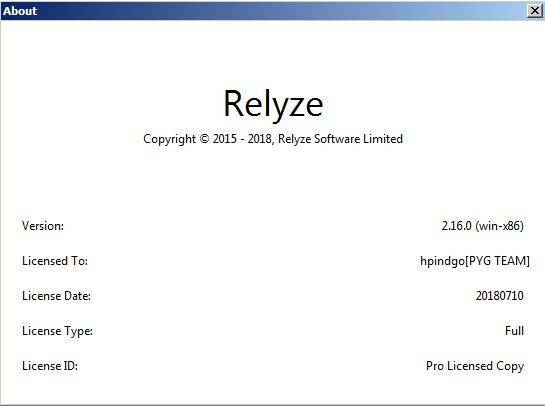 Build: Split application into Relyze.exe for UI and RelyzeCore.dll for analysis engine. Build: Update SQLite3 from 3.25.0 to 3.26.0.